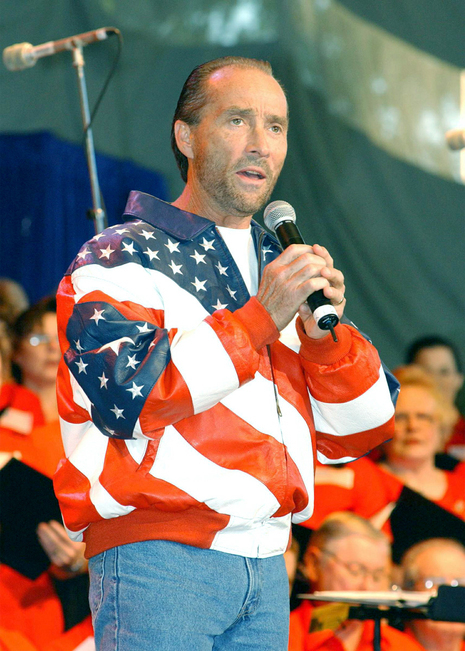 Lee Greenwood Releases "God Bless the USA"
"God Bless the USA" is an American patriotic song written by country musician Lee Greenwood. The first Greenwood album it appears on is 1984's You've Got A Good Love Comin'. It reached number 7 on the country charts when originally released in 1984, and was played at the 1984 Republican National Convention with President Ronald Reagan and first lady Nancy Reagan in attendance, but the song was first widely heard during the Gulf War in 1990 and 1991, as a way of boosting morale. A music video was released for this song in 1984, depicting Greenwood as a farmer who loses the family farm. The popularity of the song rose sharply since the September 11, 2001 attacks and during the 2003 invasion of Iraq, and the song was re-released as a single, re-entering the country music charts at #16. The song could often be heard on the radio after those events, and versions of the song are widely distributed online.